Global Temperature Data Varies Wildly — We need lots of Data | Climate S.W.A.G. Who’d have thought something as simple sounding as temperature could become controversial. Measuring the Earth temperature is actually a fairly difficult task. The Earth is a big place, with a limited number of measuring points, particularly in the oceans. Any answer has more than a little SWAG. 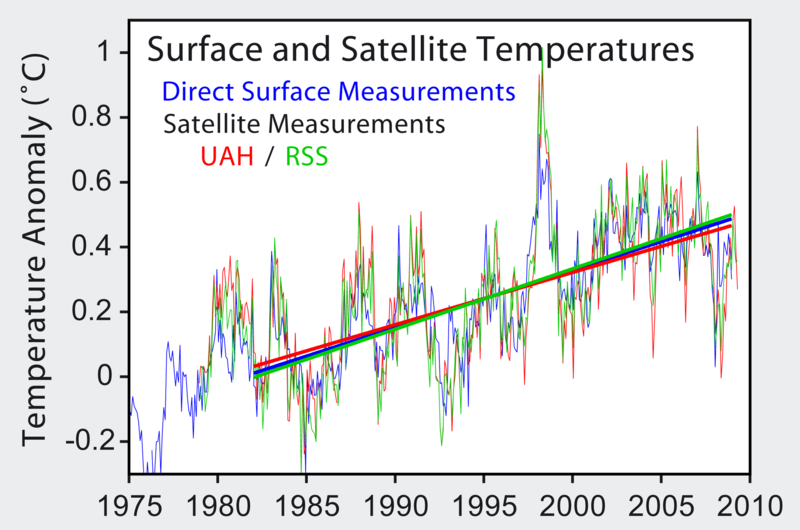 I’ve got to say, I like Satellite data better than land based global temperature data. It covers the whole world and is less likely to be manipulated by adjusting for local conditions. But what I really like is lots of data. NASA data used to go back to 1866, and the period between 1866 and 1880 had two very warm years, 1877 and 1878 and rapid annual cooling (.43 degree C) between 1878 and 1879. Imagine 1877 and 1878 being about the same as 1973 on this chart. And 1964 and 1976 were almost as low as 1890 back then too. The whole chart looked a bit flatter, particularly before 1980, and a lot less ominous. The trend was still up, it does make you wonder….what new information about the 19th century emerged since 2009 when I downloaded the old data? Now lets look at a chart that compares satellite and a group of land based data. The data matches pretty well. UAH and RSS are the two principal US sites that do Satellite data. They compensate for Satellite errors in different ways. RSS is regularly a bit higher than UAH, but they match well. I am not sure which direct measurements were used in this comparison I pulled off Wikipedia. Probably the East Anglia, UK data or perhaps NOAA, or perhaps an average of many sites. It’s not NASA. NASA insists 2005 was warmer than 1998. I found the site while reading articles about how 2011 was either the 9th warmest in history, the 3 coldest in the 21st century or just a bit above the average of the last 34 years, depending on the article, or the data source and how the data is presented. I am reconciled to the notion that I will likely die without knowing whether anthropogenic global warming is a serious problem or a political construct. That is because the data sets vary wildly and the background has the potential to vary wildly too. We either need to come up with a much more effective way to measure and understand the past, or we need lots more data. The data is so scattered, patterns are not going to be immediately identifiable. Lots of data will be required for confirmation. Someone looking at Satellite data in 1998 could easily draw a draconian conclusion (sound familiar), but the next 14 years worth of data failed to show continued warming. March of 2012 in the Eastern USA was very warm, but it got colder in April, And so it goes. This entry was posted in Climate Change, Uncategorized and tagged climate change, climate science, NASA, RSS, satellite data sets, tempeature data, UAH. Bookmark the permalink. Pingback: Arctic Ice Data Set — Too Small to be Useful | Climate S.W.A.G.